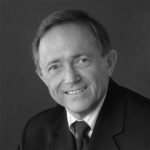 Dr. Borcherdt’s career is marked with “exceptional scientific contributions in the fields of seismology and engineering seismology, extraordinarily broad in scope” as noted on the Presidential Distinguished Service Award he received in 2010 as the highest honor of the U.S. Department of Interior. His contributions, evident in 200 publications, include pioneering site-response studies resulting in Vs30 site-response characterization procedures adopted worldwide in building codes and seismic-hazard mitigation maps; theoretical solutions of fundamental wave propagation problems in seismology that extend the mathematical framework for seismology to all linear anelastic media as presented in his graduate level textbook; “scientific leadership in engineering seismology” as noted on his US Department of Interior Meritorious Service award (1993), and participation on several building code committees and advisory panels. Borcherdt is a foremost authority on use of strong-motion data to characterize site response for use in building codes and seismic hazard evaluations. His initial pioneering work provided the first compelling evidence of site resonances on soft soils in the U.S., as published in the Bulletin of the Seismological Society of America in 1970. Subsequent comparative strong ground-motion and shear-wave velocity measurement studies in the San Francisco and Los Angeles regions under his leadership led to his introduction of the now famous “Vs30” as a metric to distinguish site response characteristics of near-surface geologic deposits. His seminal paper on “Estimates of Site-Specific Response Spectra for Use in Earthquake Resistant Design” for which he received an “Outstanding Paper Award” from Earthquake Spectra in 1994 provided the initial Vs30 definitions of site classes and corresponding strong-motion site coefficients that were adopted in consultation with many colleagues and applied to building codes that continue to be used throughout the world. Borcherdt’s 2009 graduate textbook Viscoelastic Waves in Layered Media provides general mathematical solutions for fundamental wave propagation problems in seismology that are valid for any layered media with a linear response, elastic or anelastic regardless of the amount of intrinsic material absorption. These more general solutions, derived by the author, reveal new physical characteristics of P and S body waves and Rayleigh- and Love-Type surface waves in multi-layered anelastic earth models not predicted by previous theory. These more general solutions were termed at a recent workshop as a doorstep to a new era in seismology, not only because they explain changes in amplitude, wave speed, and particle-motion characteristics along seismic ray paths that were previously unexplained, but also because they provide exact closed-form theoretical solutions for wave-propagation problems in an infinite number of types of anelastic media. The general solutions provide the basis to improve anelastic wave prediction and inversion models for a variety of problems in engineering, seismology, exploration geophysics, and solid mechanics. Borcherdt’s leadership as chief of various USGS projects and branches at the federal NSF-USGS National Strong-Motion Program resulted in: 1) his coordination of the first USGS multidisciplinary seismic zonation effort (MF-709 ) resulting in maps used extensively in required California City and County Seismic Safety Elements and as prototypes for maps required by California Seismic Hazard Mapping Law AB-3897; 2) his design with colleagues of the first microprocessor controlled wide-dynamic range (180dB) digital strong-motion recording system (GEOS, patent # 4,603,486) as a prototype for commercial instrumentation; 3) numerous (>30) portable GEOS strong-motion aftershock studies in the U.S., Mexico, Chile, Canada, Armenia, South Africa, and Turkey yielding new insights on earthquake-source, crustal-structure, and site-response characteristics; 4) installation of several permanent strong-motion arrays throughout the U.S., including integrated borehole soil-response arrays in San Francisco and the notable Parkfield, California GEOS array with its unprecedented high resolution recordings of the 2004 M6 earthquake showing no discernible near-field precursory strain or displacement at sensitivities of 10-11 strain and 5×10-8 meters. Borcherdt is an honorary member of EERI and has served as editor of Earthquake Spectra, EERI Vice President, and Honors committee chair. He is an active member of SSA and charter founding member of COSMOS. He currently chairs the Engineering Criteria Review Board for the San Francisco Bay Conservation and Development Commission and is a past member of several advisory committees, including Federal Emergency Management Agency’s Working Group for Development of HAZUS, its Provision Update Committee for NEHRP Recommended Building Code Provisions, and its ATC-58 committee for development of provisions to include advancements in performance based design. Borcherdt received his B.A. (1963) and MA. (1965) degrees in theoretical mathematics from Universities of Colorado and Wisconsin and M.S. (1970) and Ph.D. (1971) degrees in engineering geoscience from the University of California, Berkeley.